"Human sacrifice, dogs and cats living together . . . mass hysteria!" After watching the dreadful 'Without a Paddle,' it was a real pleasure to sit down and enjoy Ivan Reitman's vastly superior film classic, 'Ghostbusters.' From the Columbia Pictures logo, accompanied by Elmer Bernstein's eerie score, to the moment the iconic theme song was cued, a smile full of fond memories plastered itself to my face, and the setup for the librarian ghost secured it for the remainder of the show. 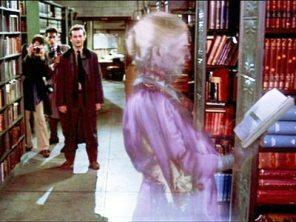 While there may not be anything spectacular about watching a couple of books moving from one shelf to the next or a really bright flashlight shine on an elderly woman's face, for me, it was all about the patient movement and pace in the expert direction before the main title rolls on screen. It's an effective opening sequence that generates interest with a farcical, light-hearted air of spookiness and mystery. Everything that follows is a grandiose spectacle of comedy and special effects, enhanced by an outstanding cast that makes the film feel as fresh and original as it did when it originally premiered. 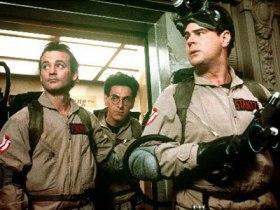 When their research grants expire and they're promptly expelled from Columbia University as quacks, three parapsychology scientists, Peter Venkman (Billy Murray), Ray Stantz (Dan Aykroyd), and Egon Spengler (Harold Ramis), go freelance, creating a ghost removal service and calling themselves the "Ghostbusters." Along with a sardonic receptionist, Janine (Annie Potts), and a fourth member, Winston (Ernie Hudson), they purchase an abandoned firehouse (still located at 14 N. Moore Street, NY!) and retrofit a 1959 ambulance dubbed "Ecto-1." Before long, the guys are hired by the beautiful cellist Dana Barrett (Sigourney Weaver), who notices some strange occurrences in her kitchen and eventually gets possessed by a demon, together with her nerdy neighbor, Louis Tully (Rick Moranis). With a sudden rise in spectral activity, the team soon faces the task of saving New York City from an untold evil brought forth by Gozer the Gozerian. Like most great comedies, 'Ghostbusters' relies on the interactions and conversations between its characters, but leaves enough headroom for some great visuals that play along with the gags. The rest of the film reveals something greatly lacking in many modern comedies: smart dialogue, full of quips, cynicism, sarcasm, and all-around zaniness that feels spontaneous rather than scripted. We don't gather a sense of jumping from one pratfall to the next or from one comedic situation to another. There's a terrific flow in the narrative where each quirky one-liner and special effects-driven prank naturally leads to other, sometimes bigger, laughs. I can't think of another comedy that smoothly transitions from a laser-tag show against a demigod to a battle with a Godzilla-like marshmallow giant without missing a beat. 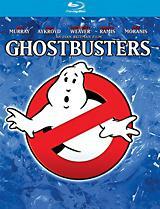 Aykroyd and Ramis wrote a terrific script with a nice blend of comedy, fantasy, horror, and sci-fi. It plays off of each actor's talent, welcoming improvisation, and suits their respective roles perfectly. The characters carry a believable camaraderie, as if they've known each other for years, and we feel comfortable around them. Though Ramis never planned on playing the role of Egon (Christopher Lloyd, Michael Keaton, and Chevy Chase were favorably considered), it is practically nigh impossible to imagine anyone else pulling it off. Winston was also written with Eddie Murphy in mind, but Hudson does such a terrific job in his low-key role that Murphy's exuberance could only be viewed as a distraction. The team rightly allowed Murray to go all out with Venkman and establish that cynical comic persona for which he is now celebrated. With Reitman reining it all together, the spook-fest that is 'Ghostbusters' still produces laughs of epic proportions. Added to this is the use of physical props and animatronics spliced into the film, which recalls an earlier time of cutting edge technology. With a cemented trend for the use of CGI effects in modern moviemaking, there is something charming and endearing about watching some old-school special effects do their thing. Of course, this new Blu-ray version greatly exaggerates the artificiality of it all and makes the tricks-of-the-trade appear dated by comparison. But these fabricated creatures participate in the humor and become a part of the storyline, turning 'Ghostbusters' into that rare exception where such effects actually compliment the film. Over the years, Slimer has evolved into the undisputed mascot of the franchise, while the Stay Puft Marshmallow Man is now enjoyed as one of the funniest monsters to grace the silver screen. Even Ecto-1 is easily recognized today as the official vehicle of the Ghostbusters and looks more like a clown car than a serious transport of paranormal equipment. Capitalizing on a popular and universal interest in sci-fi, extraterrestrials and the paranormal, 'Ghostbusters' remains a timeless classic, full of memorable, understated lines ("You know, you don't act like a scientist"; "They're usually pretty stiff"; "You're more like a game show host") and many well-known scenes, like the librarian ghost. Celebrating its 25-year anniversary (it originally premiered on June 8, 1984), the film continues to win audiences with a large, devoted fanbase at its heels, and remains one of the most successful comedies in film history, next to 'Shrek 2' (over $500 million, adjusted for inflation). This cinematic gem is one that shouldn't be missed . . . by the living or the dead. Going into this Blu-ray edition of 'Ghostbusters,' I was concerned Sony would use the same so-called "remastered" version from the botched 2005 double-feature DVD gift set. To my disappointment, those fears are justified with this 1080p/AVC MPEG-4 transfer looking suspiciously similar to that master. However, it appears technicians have gone back and tweaked the picture to a more faithful presentation, giving fans at least a small shimmer of hope (the bright green glow of Slimer in Chapter 6, when he's captured at the hotel, is finally gone and looks as it should). Regardless, the picture remains slightly cropped to better fit 16:9 screens (taken from a 2.20:1 and 2.35:1 OAR to this new 2.40:1 size, so it's barely noticeable without closer examination) and many of the same anomalies continue. 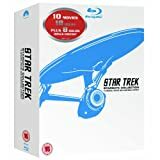 I have a feeling this Blu-ray disc will be a topic of debate, as some will approve of this new look, while others with fond memories will miss the warm reddish appeal replaced with this bluish-green tint. On the bright side, though, side-to-side comparisons reveal the Blu-ray a clear winner with improved clarity and resolution, and a much sharper image overall compared to other standard definition counterparts. The color palette also receives a pleasant upgrade, displaying nice saturation in the primaries and accurate secondary hues. Architectural details are a nice treat to look at, especially at a distance, with the weatherization of the exterior of buildings and many of their intricacies clearly visible. There are a few scenes throughout that appear soft, but obviously inherent to the photography and the film's age rather than a transfer weakness. The image also possesses an appreciable depth of field that adds to the '80s film-like quality. Unfortunately, the positives are offset by a series of negatives carried over from an over-processed remaster. Where we run into trouble is the contrast and brightness levels, which have been boosted to a dissatisfying degree and ruining the quality of key sequences. Although whites and blacks can at times look crisp and deep, there are many instances of white-washing and black crush. This is most apparent towards the end when the Ghostbusters are about to confront Gozer and what should look like fog running down stairs is a giant overexposed white blob. By also running contrast too hot, blown-out highlights interpret natural film grain as distracting mosquito noise, taking away fine object details and appearing noticeably heavy in a few dark scenes. Fleshtones are also affected by this process, coming across as warm for the most part, but waver a bit between natural and unrealistic. Facial complexions can appear waxy and lacking in textural detail, but DNR is not the culprit or even applied to this transfer from what I could see. Of all previous versions released over the years, including a laserdisc that Ivan Reitman has publicly rejected, this high-definition version is the best 'Ghostbusters' has ever looked. There is no doubt about that, and many will be pleased with the upgrade. Sadly, there remains the possibility of Sony using the alleged "remaster" from the 2005 DVD, since the picture quality appears hindered by many of the same anomalies. But with only my suspicions to go on, the video presentation receives three and half stars instead of the potential four. Arriving with a 5.1 Dolby TrueHD soundtrack, I wasn't expecting 'Ghostbusters' to sound this amusing and entertaining. Unlike the picture quality, it sounds as if engineers revisited the original recording elements and opened it up for a wider presentation with sparing use of the surround speakers. Originally an '80s stereo mix, the audio is nicely maintained and balanced across all three front channels, feeling expansive and naturally spacious. The entire soundstage contains various special effects and ambient sounds with a wide dynamic range, offering decent room penetration and clarity throughout. The original musical score by Elmer Bernstein and the iconic theme song by Ray Parker, Jr. enjoy a broad and sometimes engaging soundscape, with minor bleeds in the background. Dialogue is mostly clear and intelligible, but there were a few moments where the vocals sound canned and unrealistic. Not sure if the new encode is at fault or if this might be inherent to the original recording. As expected, surround activity is limited, with only a few atmospheric cues, like the sound of crickets or New York street traffic heard in the distance. Directional pans exhibit smooth movement between the channels for a few pleasing moments of envelopment. Expanding the sound field a bit, the lossless track becomes lively toward the third act once ghosts escape from the containment grid. The battle with Gozer fills the room with plenty of activity in the rear speakers. Low-frequency effects are quite weighty for a 25-year-old sound mix, adding palpable depth to each time the "proton packs" are activated and used. All things considered, this is an enjoyable and well-balanced audio presentation. Sony Home Entertainment unleashes this well-equipped Blu-ray edition of 'Ghostbusters' with many of the same bonus features found on the 2005 DVD double-feature gift set (which only adds to my suspicion of the wrong master being used). Still missing, though, is the MST3K-style commentary from the original 1999 release, which was quite enjoyable. It is, however, compensated by a nice arrangement of exclusive material, making this release worth the upgrade for fans. The material is also a mix of standard definition and HD video. Audio Commentary - Director Ivan Reitman is joined by co-writer/actor Harold Ramis and associate producer Joe Medjuck for this informative yet somewhat dry commentary. Originally recorded for the 1999 release, the three men clearly enjoy each other's company and offer many fun details about the production, as well as ideas of where many of the concepts originated. While it would have been nice to offer a more recent commentary, especially one that includes Bill Murray and Dan Aykroyd, the track is interesting for fans unfamiliar with the facts revealed here. The commentary also comes with optional subtitles. Featurette: "Scene Cemetery" (SD, 9 minutes) - This collection of 10 deleted scenes is comically and aptly named. Though they would've added little to the film, they are still enjoyable and amusing to watch, notably the "Bums" clip. Featurette: "On the Scene with the 'Ghostbusters'" (SD, 10 minutes) - This vintage featurette always brings back memories of the '80s. Using behind-the-scenes footage to maintain interest, the short includes interviews with cast and crew talking about various aspects of the filmmaking process and mentioning the use of the latest in expensive technology for the F/X team. Featurette: "Cast and Crew Featurette" (SD, 11 minutes) - Originally recorded for the 1999 DVD release, this featurette is the most recent collection of interviews with Ivan Reitman, Dan Aykroyd, and Harold Ramis chatting about the film and its impact. Featurette: "SFX Team Featurette " (SD, 15 minutes) - This is a panel discussion with the original F/X team relating their experience of working on the film, while photos of the props are dispersed throughout. Featurette: "Multi-Angle Featurettes" (SD, 6 minutes) - Broken into three sections ("Spook Central Exploding," "She's A Dog," and "Crossing the Streams"), fans can enjoy watching the rough video and animation work in before-and-after fashion done to three particular scenes. Featurette: "Storyboard Comparisons" (SD, 6 minutes) - Again, broken into three sections ("Slimer," "Dogs Drag Dana," and "Atop Spook Central"), viewers can watch the hand-drawn storyboards and compare them to the film's final cut. After 25 years, 'Ghostbusters' remains just as amusing and hilarious as when it first hit theaters, full of gut-busting dialogue and many memorable scenes. Demonstrating that big-budget special effects can mesh well with laugh-out-loud comedy, the film also enjoys being one of the most successful comedies ever made and continues to convert a new generation of fans with each viewing. This Blu-ray edition of the Ivan Reitman classic arrives with a very good video presentation (though suspicious of the source material), a nice lossless audio track, and a healthy supplemental package. 'Ghostbusters' is a must own!